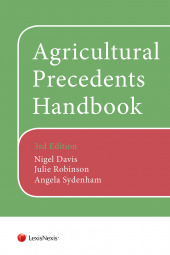 Agricultural Precedents Handbook is a specialist publication providing those advising farmers and other members of the rural community with a comprehensive collection of time-saving and reliable precedents, accompanied by a very useful commentary. A CD-ROM accompanying the book contains all of the precedents allowing users to download and adapt each document as necessary. There are over 100 precedents in the revised edition.